The city is on AT&T’s very short list for 5G rollout later this year, which is a good thing. Economists estimate the global economic impact of 5G in new goods and services will reach $12 trillion by 2035, according to the World Economic Forum, as mobile technology connects people to not only information and other people, but to everything. 5G will greatly help traffic-snarled metros like Atlanta, which recently ranked in the Top 10 Most Congested Cities in the World. Powering driverless cars and making “smart city” infrastructure smarter, the technology will save time and headaches in this major commuting town. It will also save us money—lots of it. According to Inrix, Atlantans spent an average of 70 hours last year in traffic jams during peak congestion time, costing drivers, by one estimate, more than $1,900 each and the city billions from direct and indirect costs. As Fortune magazine reported, the individual costs are based on the value of fuel and wasted time, and the city costs are based on business fees from company vehicles idling in traffic. These costs are then passed on to households through higher prices on goods and services. At the end of a 5G work day, all people will have to do is jump into their autonomous vehicles and relax as they communicate with other vehicles and traffic sensors to chart the quickest, most efficient way home. Atlanta was recently named the 6th hottest tech startup city in America by the U.S. Chamber of Commerce. It doesn’t take a Silicon Valley-groomed Chief Technology Officer to figure out that 5G will add considerable fuel to that fire, especially in light of AT&T choosing the city in its initial next-generation rollout. 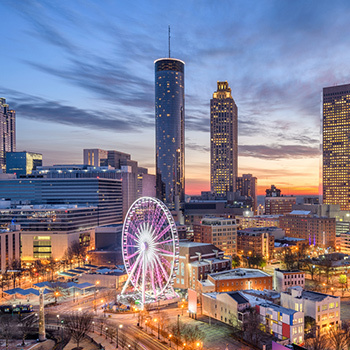 Crediting startup connectivity in general and specifically the fintech, education tech and health tech sectors, Atlanta “rocketed up” more than 15 places in the U.S. Chamber’s annual Innovation That Matters report. The brain power and business initiative, combined with the new lighting-quick wireless tech, could push Atlanta to the forefront of the “Internet of Skills.” This concept borne, of a partnership between Ericsson and King’s College London, centers around the ability to use robotics and haptic feedback to provide services over a vast distance. Remote surgery has been a reality for a while, but, as reported by CNN, 5G speeds should eliminate all delays and lag so that a surgeon here in Georgia could get instant feedback from a procedure he or she’s doing with virtual reality equipment and special, “haptic” gloves across the globe. The addition of 5G stands to benefit Georgia’s manufacturing sector. At the recent Governor’s Awards, Georgia Gov. Nathan Deal said 339 new manufacturers, representing $3.4 billion in investment and 11,300 jobs, have chosen to move operations to the state in 2017-2018. The sector accounts for $57.3 billion per year in state revenue and 10.8 percent of its GDP. The connectivity and computing capability inside the device in your hand, pocket or bag today would have been almost inconceivable less than two decades ago. The advent of 5G telecommunications will continue to push the boundaries of what is possible.